I've created maps that feature Chicago area programs that work with students in a tutoring, mentoring, or mixed capacity during non-school hours. This listing includes those programs that are currently known to exist, and listed in the Tutor/Mentor Connection (T/MC) database (which can be accessed via the T/MC's searchable Program Locator). Please visit the Tutor/Mentor Connection website for more details. The Tutor/Mentor Connection (T/MC) is dedicated to improving the availability and quality of comprehensive, long-term, volunteer-based tutor/mentor programs in high-poverty areas of the Chicago region and other large US cities through an ongoing, dynamic exchange of ideas. I've also shown major highways that show potential volunteers the proximity between programs and commuter routes. Finally, notice the zip codes. If you want to zoom in and learn more about programs located in a particular zip code, visit the interactive Zip Code map, another tool that provides access to the T/MC data. 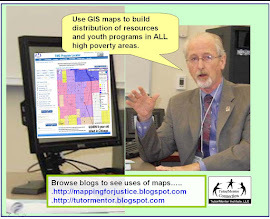 The second map I've created shows the locations of all known programs, in relation to "failing schools," where many students of course can use as much tutoring and mentoring as they can get. In my next post, I'll break these down further, categorizing by "Age Group Served" (Elementary, Junior High, High School) and "Type" (Pure Mentor, Pure Tutor, or Mixed Tutor/Mentor).